Q: During the past two days, China and Indonesia held meetings of the China-Indonesia dialogue mechanism at deputy prime minister level and the China-Indonesia high-level economic dialogue in Beijing. Can you elaborate on the outcomes of these two meetings? A: With regard to the two meetings, the Chinese side has released the relevant information. On August 21, State Councilor Yang Jiechi co-chaired the sixth meeting of the China-Indonesia dialogue mechanism at deputy prime minister level with the Indonesian Coordinating Minister for Political, Legal and Security Affairs Wiranto in Beijing. The two sides said that they will enhance their comprehensive strategic partnership both in depth and breadth based on the consensus reached by President Xi Jinping and President Joko Widodo. The two sides agreed to maintain high-level exchanges and close communication on major issues concerning the bilateral relations, strengthen alignment of development strategies and cooperation on the Belt and Road Initiative, deepen cooperation in the fields of defense, law enforcement, counter-terrorism, anti-drug, cyberspace, maritime affairs and aerospace. The two sides also agreed to jointly uphold the peace and stability of the South China Sea and the region at large, promote the continuous and further development of China-ASEAN relations and East Asia cooperation and enhance the communication and coordination in the international and regional multilateral mechanisms. After the meeting, the two sides inked the meeting minutes. On August 22, State Councilor Yang Jiechi co-chaired the third meeting of the China-Indonesia high-level economic dialogue with the Indonesian Coordinating Minister for Economic Affairs Darmin Nasution. The two sides spoke highly of the positive progress achieved in bilateral mutually beneficial economic cooperation since the second meeting. The two sides agreed that they should seek greater synergy between the "21st Century Maritime Silk Road" initiative proposed by China and Indonesia's "Global Maritime Axis" vision, jointly promote the continuous and further development of China-Indonesia economic cooperation and trade, further enlarge the scale of the two-way investment, expand the all-round cooperation in the fields of infrastructure, agriculture, finance and energy between the two sides and explore the opportunities for cooperation in such emerging industries as e-commerce. After the meeting, the two sides signed the meeting minutes and the memorandum of understanding on financing cooperation in infrastructure. China and Indonesia enjoy profound traditional friendship. Recent years have witnessed the rapid development of the bilateral relations, frequent high-level exchanges and the comprehensive advancement of cooperation across the board. The China-Indonesia dialogue mechanism at deputy prime minister level and the China-Indonesia high-level economic dialogue are the high-level mechanisms for the two countries' cooperation in the fields of political security and economy, and it is the first time that the meetings of these two cooperation mechanisms were held back to back in China. The two sides had an exchange of in-depth views and reached important consensus on bilateral relations, political security, economic cooperation and the international and regional issues of common concern. This will further enhance mutual political trust, deepen bilateral strategic alignment, elevate the pragmatic economic cooperation and trade to a higher level and move forward the bilateral comprehensive strategic partnership. Q: According to reports, on August 22, the US Secretary of State Rex Tillerson said that the DPRK has not launched missiles or taken provocative actions since the unanimous adoption of the new UN Security Council resolution concerning the sanctions on it. He is pleased to see that the DPRK has certainly demonstrated some level of restraint and perhaps the US is seeing its pathway to having some dialogue with the DPRK sometime in the near future. The DPRK needs to do more, but we should recognize the steps taken by the DPRK so far and it is quite important to take note of this. What is your comment on the remarks of Secretary Rex Tillerson? A: We have noted relevant remarks of the US Secretary of State Rex Tillerson, especially his emphasis on the possibility of the dialogue between the US and the DPRK. Recently, with the efforts of all relevant parties, the tense situation on the Korean Peninsula has shown the sign of abatement, but it still remains highly complex and sensitive. All relevant parties, especially the US and the DPRK which are the parties directly concerned, need to exercise restraint and make more solid efforts. We have noted that during the last few days, the leaders of many countries stated that the Korean Peninsula nuclear issue should be resolved peacefully. It is fair to say that under the current circumstances it is the shared aspiration and the unanimous voice of the international community to call for dialogue, peace and the easing of the tensions instead of confrontation, war and mutual provocation. We hope that all relevant parties can courageously undertake their due responsibilities, show goodwill towards each other and take the right actions that can help to ease the tense situation. Meanwhile, they need to focus on the general direction of promoting peace talks, actively conduct engagements and dialogues and make solid efforts for the peaceful settlement of the Korean Peninsula issue through dialogue at an early date. Q: Tomorrow will mark the 25th anniversary of the establishment of the China-ROK diplomatic relations. The China-ROK relations have achieved remarkable progress and fruitful outcomes. What is China's comment on the China-ROK relations in the past 25 years? What is China's expectation for the direction of the development of the China-ROK relations in the future? A: During the past 25 years since the establishment of the China-ROK diplomatic ties, the two sides have pushed forward their bilateral relations in the spirit of the joint communiqué on the establishment of diplomatic relations and the principles of mutual understanding and mutual respect, which has delivered tangible benefits to the two countries and the two peoples and made important contributions to regional peace, stability and prosperity. The positive outcomes achieved in the development of the bilateral relations are worth cherishing and upholding jointly by the two countries and the two peoples. The Chinese side places emphasis on developing its relations with the ROK. 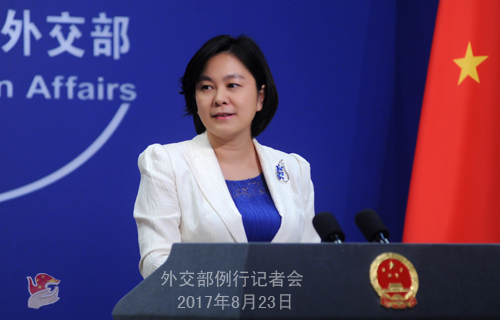 We would like to take the opportunity of the 25th anniversary of the establishment of the China-ROK diplomatic ties to earnestly review and take stock of the experiences and lessons since then, stay true to our original aspirations, cement mutual trust, properly handle differences and promote the sound and steady growth of the China-ROK relations. Q: The UK Minister of State at the Foreign and Commonwealth Office Mark Field has been visiting Beijing. Yesterday, he met with China's Special Representative for Korean Peninsula Affairs, Kong Xuanyou. Can you give us details about that particular meeting and what message Assistant Minister Kong put forward specifically about the Korean Peninsula issue? A: Yesterday China's Special Representative for Korean Peninsula Affairs, Kong Xuanyou met with the UK Minister of State at the Foreign and Commonwealth Office Mark Field and they exchanged views on the Korean Peninsula issue and other issues of common concern. China's position on the Korean Peninsula nuclear issue is quite clear-cut. We stay committed to the denuclearization of the Korean Peninsula, the peace and stability of the Peninsula and the general direction of the political settlement of the issue. We hope that under the current circumstances all relevant parties can exercise restraint, give positive consideration to and accept the "dual track" approach and the "suspension for suspension" initiative proposed by China and strive for the final settlement of the Korean Peninsula issue through dialogue and negotiation. Q: On Tuesday, the US Department of the Treasury announced another round of sanctions against the Chinese and Russian entities. The US government claimed that these enterprises and individuals, including many Chinese coal companies, financed and facilitated the nuclear and missile programs of the DPRK. What is your comment on this new round of sanctions? A: The Chinese side opposes the unilateral sanctions outside the framework of the UN Security Council, especially the "long-arm jurisdiction" imposed by any other country on the Chinese entities and individuals based on its own domestic laws. This position is clear-cut and consistent. China always implements the DPRK-related resolutions of the UN Security Council in their entirety and fulfills its due international obligations. Our efforts are there for all to see. We will investigate and deal with the Chinese enterprises and individuals in accordance with our own domestic laws and regulations provided that they are suspected of violating the relevant resolutions of the UN Security Council. The relevant actions of the United States cannot help to resolve the relevant issues. Neither are they conducive to the mutual trust and cooperation between China and the United States on the relevant issues. We request the United States to immediately stop the relevant wrongdoing. Q: According to the reports of the Japanese media, Japan's Ministry of Defense has decided to apply for 5.2 trillion Yen for defense budget for the fiscal year 2018, which will reach a record high. In addition to responding to the situation on the Korean Peninsula, this is also targeted at the maritime activities on the part of China. What is your comment? A: We have noted the relevant report and are concerned about this. In recent years, Japan has never stopped fabricating, playing up or hyping the so-called "China Threat". However, it keeps increasing its own defense budget and engaging in arms expansion and has implemented the new security laws. Japan's actions and its real intentions merit our high vigilance. The Japanese side should honestly clarify its intentions to its neighboring countries and the international community. Due to the historical reasons and given the current situation, the international community, Japan's neighboring countries in Asia in particular, are always closely following its military moves. We urge the Japanese side to stop playing up the so-called "China Threat", earnestly draw lessons from history, take seriously the security concerns of its neighboring countries in Asia and act prudently in the field of military security. Q: It is reported that on August 22, the government of Panama appointed Francisco Escobar Pedreschi as its first ambassador to China. What is your comment? A: China welcomes the appointment of Francisco Escobar Pedreschi as the first ambassador to China by the government of Panama. 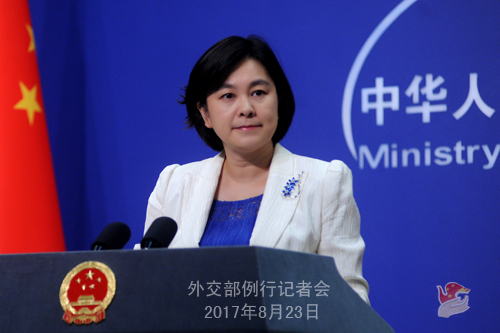 The Chinese Foreign Ministry is willing to provide all the needed facilitation and assistance for his fulfillment of duties in China. Since the establishment of diplomatic ties in June this year, the friendly exchanges and mutually beneficial cooperation in various areas between China and Panama have been actively promoted, which demonstrates enormous potential and holds a promising future. We believe that during the tenure of ambassador Escobar, his work will achieve fruitful outcomes. Q: According to the news of Xinhuanet, recently, the Japanese TV station TBS broadcast a historical documentary about the "poison gas island" which criticizes the Japanese troops for producing and using poison gas during the Second World War. What is your comment? A: We have noted the relevant report. We appreciate that those visionary Japanese people can face the history squarely and call for peace. During the Second World War, the Japanese troops produced and used chemical weapons, which caused a large number of casualties among the combatants and the innocent civilians in China and other victimized countries. What needs to be pointed out is that although over seven decades have passed since the end of the war, now the chemical weapons abandoned in China by Japan still pose serious threat and harm to the life and property of the Chinese people and China's ecological environment. We urge Japan to show deep remorse for the aggression history of the Japanese militarism and thoroughly destroy the abandoned chemical weapons in China so as to return the clean land to the Chinese people. Q: The BRICS Summit will be held in ten days. Has the Indian Prime Minister Narendra Modi confirmed that he is definitely coming? Is China concerned that due to the border dispute in Dong Lang perhaps the Indian Prime Minister won't come? 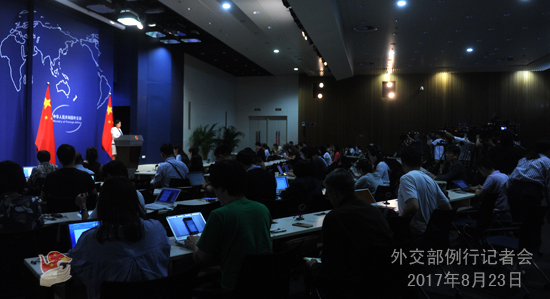 A: The 9th BRICS Summit will be held in Xiamen, Fujian Province from September 3 to 5. Now the preparatory work in all areas is advancing in an orderly fashion and we are almost all set for the Summit. We are convinced that with the concerted efforts of all relevant parties, this Xiamen Summit will achieve success and elevate the BRICS cooperation to a higher level in its second decade. You mentioned the Indian border troops' illegal crossing of the boundary in Dong Lang. China's position is quite clear-cut on this. I want to reiterate that the immediate and unconditional withdrawal of all the trespassing personnel and equipment serves as the prerequisite and basis for the settlement of this incident. Q: According to the report, the Nepali Prime Minister Sher Bahadur Deuba has started his visit to India today. Some India media said that India is concerned that Nepal has acquired a large amount of investment from the Belt and Road Initiative proposed by China and India is under the pressure to "counterbalance China with a huge project". What is your comment? A: I haven't read the report mentioned by you. But I would like to point out that the international relations in the 21st century are not zero-sum games and do not mean that one country need to counterbalance another. Both Nepal and India are important neighboring countries of China. We welcome the sound development of the Nepal-India relations and hope that India can put the growth of the China-Nepal relations into perspective. The Belt and Road Initiative is open and inclusive and it is conducive to promoting the connectivity, common development and prosperity of the regional countries. We welcome the participation of all countries on the basis of voluntarism and in the principle of extensive consultation, joint contribution and shared benefits.